Sometimes you want to go camping. But you don’t want to go camping. You know. The battle of setting up the tent, the condensation that forms on the inside of the tent and awakens you with a drip, the rock the inevitably materializes directly underneath your shoulder blade in the middle of the night. 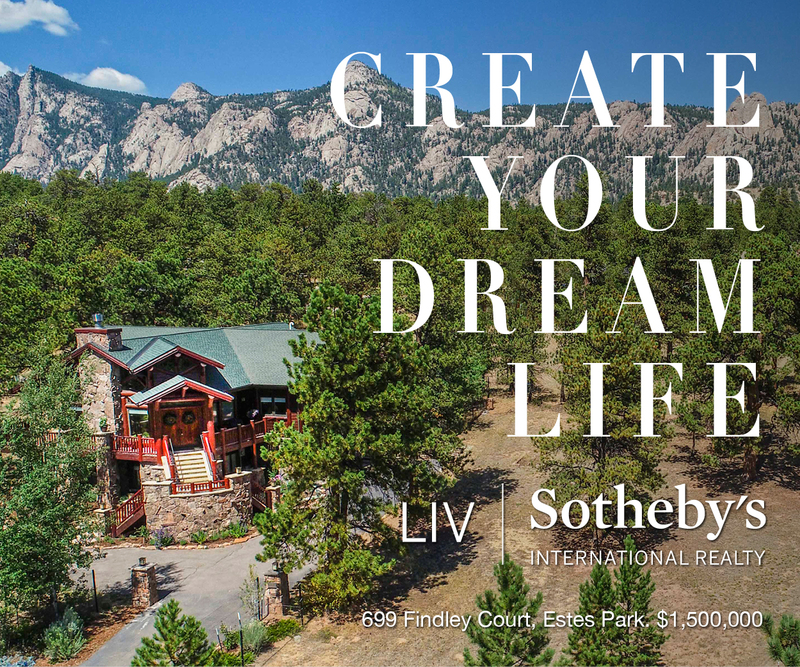 Spending time in nature is a popular activity in Boulder, and definitely a crucial part of being in Boulder. But tenting it isn’t for everyone. 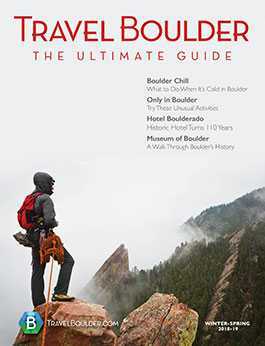 Luckily, there are other ways to do it — ways that are equally as Boulder, because they have Boulder roots. Two Boulder-based companies have created innovative alternatives to regular camping. 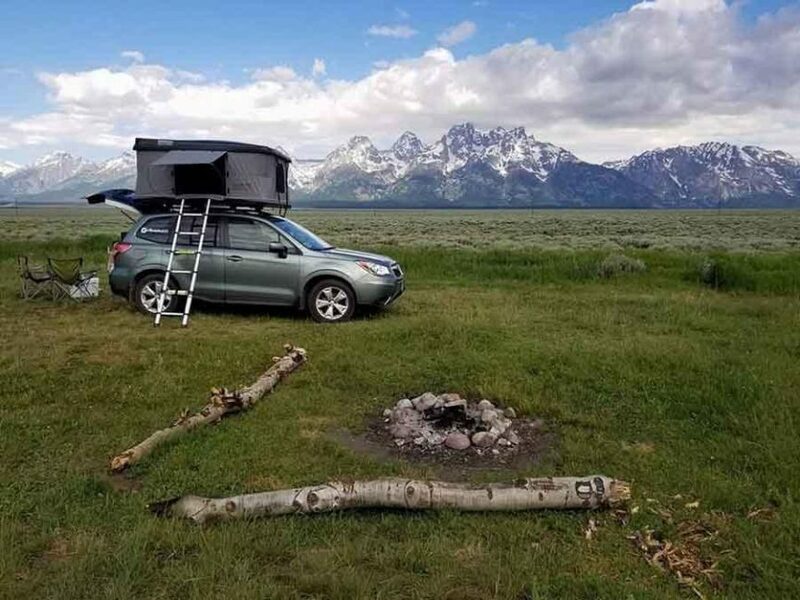 Not only are these ideas comfortable and convenient, but they also extend the camping season later into fall or even winter. Because if you don’t have to nestle down onto the icy ground, popping up a temporary home in nature is infinitely more comfortable. 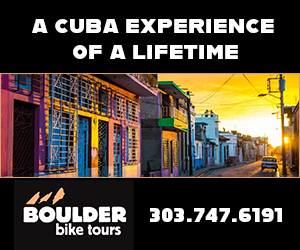 If you’re looking for things to do in Boulder, here’s a look at two alternative options for camping with Boulder ties. Colorado Teardrops, based in Boulder, rents and sells teardrop-style campers. 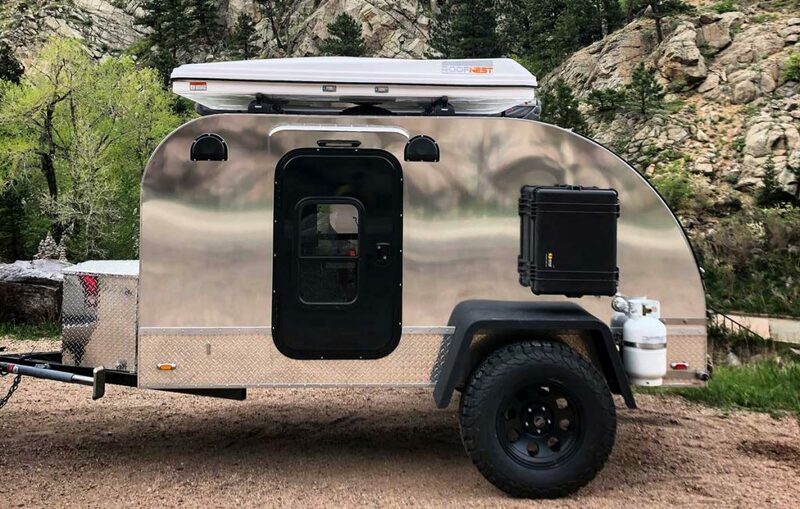 The company was founded in 2014 in Boulder, and all trailers are designed and manufactured from scratch in Boulder. As the story goes, founder Dean Wiltshire first began building boats as a teenager, then built furniture, cabinets and eventually custom homes. Colorado Teardrops started after Wiltshire and his daughter went camping in Yellowstone. “We camped next to a scary sign nailed to a tree that said, ‘Danger: Bear activity.’ It was one of those forests you step into and think, ‘This is an eerie, dark forest,’” Wiltshire says. The morning they left camp, a grizzly bear killed a hiker nearby. Wiltshire was pretty freaked out and wondered what he could do to stay safe and feel safe but not have to give up camping, which he and his daughter enjoyed doing together. At the time, he was driving a Honda Accord. Not exactly built to haul a 30-foot trailer. He decided to buy his own teardrop-style camping trailer, light enough that his small car could handle it. But he ended up disappointed that he couldn’t rent one to try first, not to mention the lack of options to choose from. He was told he had to wait six months to get one. As a builder with an artsy mind, he decided to build one himself. That was the beginning of a business that continues to boom. Today, Colorado Teardrops offers four different styles of trailers. All are aerodynamic, lightweight, high-quality, rugged and built to take off-road, all seasons, for decades. Come rain, hail or snow, these campers will preserve your camping trip. Yet these trailers are compact and light enough to be pulled by almost any car (even a Honda Accord), while barely affecting gas mileage. Because it’s small, you can maneuver it into tight spaces and backcountry areas where big RVs can’t fit. 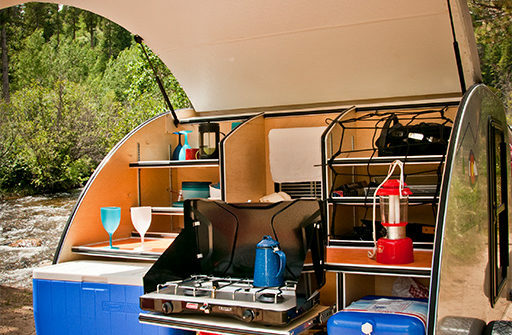 The Teardrop campers are named for their sleek, aerodynamic profile. Go where no RV has gone before. He thinks of the teardrops as a modern equivalent to a ship in the 1600s, when people would set off to places unknown. “This is about an adventure and going exploring, but with great insulation and safety,” he says. Which brings us back to the bears. He says one of his customer’s campers was shaken up by a black bear. The people inside were unharmed, as was the camper. That makes the score Colorado Teardrops: 1. Bears: 0. Rentals start at $110 a night and the base price to own one is $11,300. Add an optional bunk bed to sleep a small family. For people who don’t want to pull a camper behind them, you can just pop one on your roof. Roofnest, a Boulder-based company, makes rooftop tents with walls three times as waterproof as a standard tent. These lightweight, hardshell rooftop tents turn any car into a camper. 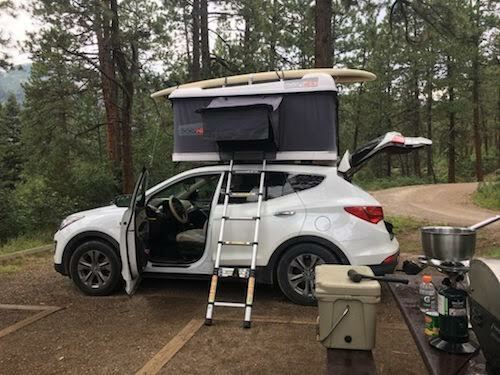 Roofnest claims nearly every car (with crossbars on the roof rack) can hold these “small but mighty” rooftop homes; their roof rack can even support up to 100 pounds of gear. Roofnests are aerodynamic for driving and easy to pop up in just a few minutes. You just undo the straps and give it a push. The pneumatic gas struts automatically open it. No extra tools or work required. There’s even a mattress built in, so you can keep your blankets and pillow right in the tent when it’s closed. Your bed is made in an instant. Oh, and because it’s up high, you don’t have to worry about little ground critters creeping into your tent. There are several different models with different features, like the Sparrow, with a fiberglass shell that compacts to be tiny (less than a foot tall). 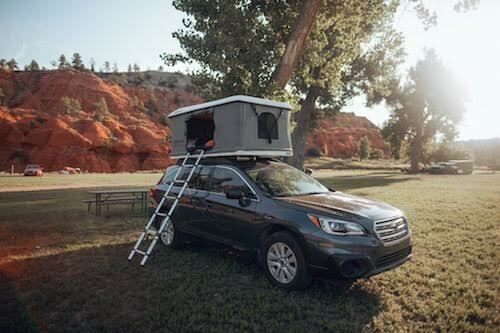 Roofnests are also a ton cheaper than a separate camper — models start at $2,195. It’s no wonder why Roofnest, which launched in 2017, is quickly growing. The company was even featured as Outside Magazine’s editor’s top pick for the Summer Buyer’s Guide.